A discreet, cost effective and low maintenance security barrier to protect windows against vandalism, breakage and opportunistic burglary. A finely perforated galvanised steel mesh secured by an aluminium frame, Galvanised Steel Mesh Window Screens provides a much more attractive solution than alternative means protecting vulnerable buildings and is popular with schools, universities, community centres, industrial units, offices and flats. Quick payback – once fitted most customers find this product repays the investment many times over by reducing vandalism, breakage and burglary. 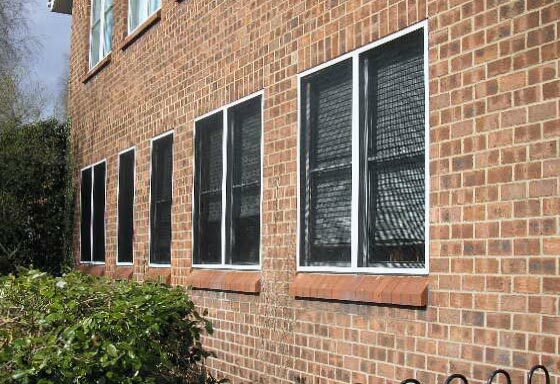 Unobtrusive appearance – from a distance the window screens resemble tinted glass but up close provides a strong visual and physical deterrent. Perforations provide maximum vision and light – whilst retaining the strength of the Galvanised Steel Mesh Window Screen. Cover strip protects fixings from attack – unlike similar products the aluminium cover strip is firmly fixed and does not easily become detached. Polyester powder coated in a wide choice of colours – to give a long lasting finish and co-ordinate with décor. Planning permission is generally not required. Sizes range from 100mm – 2500mm wide and 100mm – 1200mm high. For larger sizes a panel joining kit is required.